Today’s guest post, Be Still and Know I am God is from my friend, Beth Forbus of Sarah’s Laughter , a ministry providing Christian support for Infertility and Child Loss. I first came to know of Sarah’s Laughter through a magazine called Conceive. I recall picking up the magazine at the hospital gift shop where I work. I was blessed to read about a ministry reaching out to those with infertility. So unheard of a decade ago. As I started Dancing Upon Barren Land almost 6 years ago I’m always on the lookout for other ministries / callings similar to mine. Ministries which are solid and sound with Biblically based principles…and, Sarah’s Laughter is one of them! I love promoting others, so I reached out to Beth asking if she would come and hold her Memorial Service for Miscarried / Stillbirth Infants. She gladly has come numerous times and has ministered to hurting hearts at our HOPE Christian Infertility Support Groups as Lakewood Church. Those who were once cloaked with a heavy cloak of grief were set free from her powerful words and act of love during the service. Beth has been a tireless promoter, advocate and “momma” to those who are hurting through infertility and loss. She’s a wonderful author of books, a support group leader, she cranks out daily devotionals on SL (you should subscribe) and is founder of BabySteps, a 5k walk for infertility held in Baton Rouge, Louisiana. But most of all, Beth is my friend. She’s spoken words of life to me when I’ve experienced my own personal loss of both my parents. She’s an encourager to me when I feel the heavy load of ministry too. I’m so grateful God has allowed our paths to cross! I know you’ll love Beth’s heart as you enjoy her guest post today. Thank you, Beth! I love you! 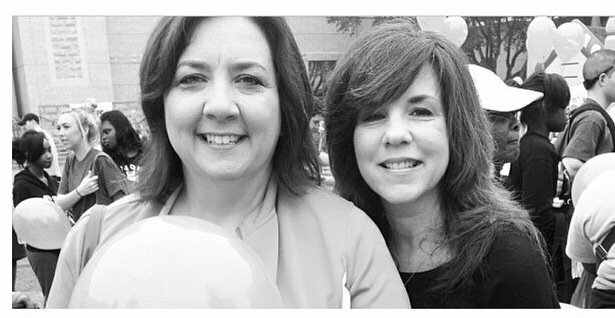 This is Beth and me at Resolve’s Texas Walk of Hope for Infertility in 2014. What’s been the biggest decision you’ve had to face in trying to have a baby? Has it been the decision to seek medical treatment or not? Telling people or keeping your struggle private? Have you had to consider whether you need to take a break this month from your attempts to conceive or just try one more time? Some decisions must be made quickly, other take time and contemplation. It can seem like your life is a constant barrage of questions demanding answers. You’ve searched for answers, yet you come up empty handed. Perhaps God is saying to you today “be still”. The psalm that houses this verse is actually a song written for a choir director. The song begins by proclaiming that God is our refuge, our strength and our help when trouble comes. The lyrics tell of earthquakes, mountains slipping into the sea, and of wars among the nations. The comfort comes in knowing that God is God and He chooses to be with us. In the midst of turmoil and confusion, we can lay down our worries and know that God is the one true and living God. Infertility can cause such chaos in your heart. It seems you think of conception and nothing else. Sometimes you just get so tired of having to make all the right choices. Should I see this doctor or find another one? How much weight should I gain/lose? Instead of childbearing being a beautiful and intimate event in the natural course of a marital relationship, it becomes a series of decisions and schedules that must be kept, and it can feel tumultuous. God says “be still”. Be still and know that God is God. Be still and rest in the knowledge that He loves you and has a magnificent plan. Let your heart be still and know that God knows your desire for a baby. Be still and know that He can heal your body of the diseases that hinder reproduction. Be still and know that the God of the universe chooses to be involved in your life, even through the struggle with infertility. You don’t have to panic even when life doesn’t pan out the way you dreamed it would because God is still God and He is with us as our stronghold. This is the 3rd time today I’ve read something reminding me of God’s invitation to be still. I guess He’s trying to tell me something. Thank you, Beth and Lesli, for sharing this today. You’re so welcome! Our God is faithful! May his peace be with you during this time.